More and more people are increasingly becoming concerned about their privacy on the internet. A virtual private network, also known as a VPN, is an easy and effective method to ensure your browsing habits remain secure and hidden from others. • Identity Protection. A VPN prevents anyone and everyone from tracking your online activities. Hide.Me stores no IP logs, tracks no user activity and otherwise collects no data which can be traced back to individual users. Additionally, because they don’t (and can’t) track individuals, Hide.Me is unable to take action in response to DCMA requests. • Navigate around Regional Locking. Content which is frequently blocked due to regional or network restrictions can now be accessed with ease. Hide.Me allows users to appear as if they’re from any region in the world. • Versatility. There are many VPN services out there. One way Hide.Me attempts to separate themselves from the pack is by offering a variety of options. The VPN operates on Windows, Mac, Linux, iOS, Android, gaming consoles, Smart TVs and more. Protocols available include PPTP, L2TP/IPsec, Open VPN, IPsec IKEv1 and IKEv2, SSTP and SoftEther. If your VPN service doesn’t work where and when you want it to, then the service won’t be much use to you. Hide.Me understands this and has made their VPN service easy to use on whatever platforms you prefer. Hide.Me is compatible with practically all major operating systems and devices including desktops, laptops, mobile devices and even gaming consoles such as Xbox One and PS4. Connection protocols supported include PPTP, L2TP/IPsec, Open VPN, IPsec IKEv1 and IKEv2, SSTP and SoftEther. They currently have 94 servers and thousands of potential IP addresses available for users. Hide.Me offers free access to their service. This free account has a limit of 2 GB per month. This is an ideal way to check out the company and see how their service meets your needs. Some people are wary of a free VPN, but we found no reason to be concerned. 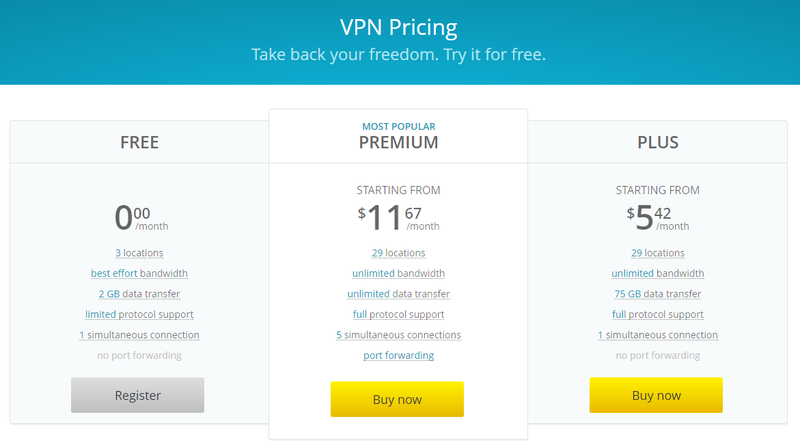 While a VPN which only offers free services is a tad suspicious, more and more providers are offering both free and paid services. The free aspect of the service is mainly a way for customers to try before they buy. The free plan does have some restrictions. Protocols are limited to PPTP, L2TP, SSTP, and IPsec. Additionally, the only locations available are Canada, Netherlands, and Singapore. Still, two GB per month is certainly enough to give the service a good test run. However, if you plan to use Hide.Me for your daily internet browsing needs, you’ll likely want to upgrade to one of their two paid plans. If you only need a VPN for limited uses throughout the month, the free service might be enough. Aside from their free plan, Hide.Me offers two tiers of paid service. They are Plus and Premium. Subscription plans for each of these paid plans are available in one, six and 12-month terms. The Plus plan starts at $10 a month. This plan offers unlimited bandwidth, full protocol support and a 75 GB monthly limit on data transfer. This plan allows just one simultaneous connection and has no port forwarding. For a six month subscription, the Plus plan costs $40. A 12-month subscription costs $65. The Premium plan offers all available options. Starting at $20 a month, this plan offers unlimited bandwidth, full protocol support, and no limit on data transfer. Port forwarding is enabled. Up to five simultaneous connections are allowed. Hide.Me accepts credit cards, bank transfers, PayPal and BitCoin. They do plan to offer more digital currencies in the future. Hide.Me does seem to emphasize customer service. Apparently, their free plan can be stopped at any time and requires no refund policy. Users who decide to purchase either the Plus or Premium plan have 14 days to check out the service. If you don’t like the service for any reason, Hide.Me will give you a full refund. Hide.Me offers one of the largest selection of protocols of any VPN service we’ve found. They have 94 servers with 1,000 of different IP addresses available. The company is headquartered in Labuan, Malaysia. The Premium plan has unlimited data transfer. The Plus plan has a limit of 75 GB each month. The free plan has a two GB monthly limit. Registration is pretty easy. No software needs to be downloaded. Users simply register, choose a protocol and connect to the network. There are plenty of clear, useful user guides on the Hide.Me site. VPN stability is almost always somewhat of an issue. The stability of any VPN can be affected by factors beyond the company’s control. For instance, if your existing connection is poor, that can affect your ability to access the VPN properly. After checking out user experiences online, however, we feel confident that Hide.Me is one of the more stable networks around. Most users will have a smooth experience. Some users need the absolute highest speed available. This is often the case if the user is interested in online gaming, streaming video, and other high-end uses. If this applies to you, we recommend you sign up for the free plan and test the service out before you commit to buying anything. 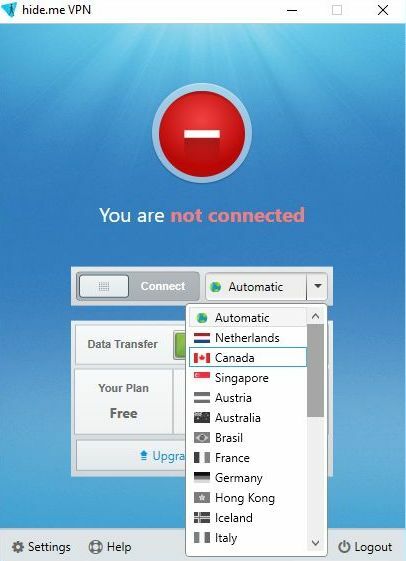 VPN speed is a common issue. While there’s no indication Hide.Me has any serious speed problems; VPN speed is always an issue you should check out for yourself before you purchase anything. Plenty of VPN services don’t track your browsing habits. After all, that’s one of the main appeals of using a VPN. But Hide.Me goes a step further. They’re the only VPN service which uses a third-party auditor. Leon Juranic, a prominent internet security expert, audits Hide.Me on a regular basis to ensure no logs are ever kept. If security is important to you, this external audit is sure to spark your interest. To be honest, we don’t anticipate most users will have a ton of problems using the Hide.Me service. But the company does seem very committed to customer service should the need arise. They offer 24/7 Live support for questions involving billing and sales. Technical questions require users to submit a ticket, although in our experience response time was very fast. Finally, they also offer an extensive on-site database. There are a lot of VPN services available. Hide.Me has three main features which help them stand out from the competition. They offer a huge amount of protocols compared to most of the competition. Their third-party audit by Leon Juranic provides an additional level of user security. 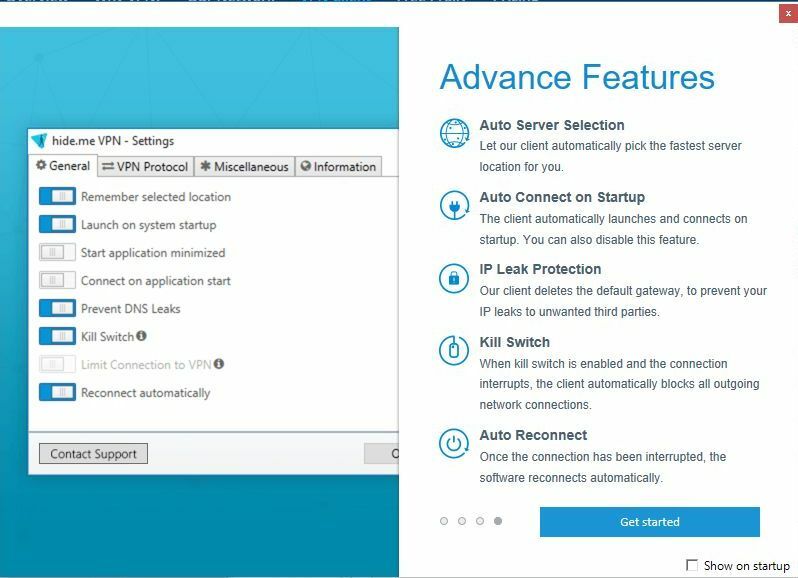 They also offer other unique security features including IP and DNS leak protection. If you’re interested in anonymous, secure, region-free browsing, Hide.Me is definitely worth seeking out.